Most everyone gets up to Babad Do'ag on Catalina/Mt. Lemmon Hiway to enjoy the scenic overview, and to stretch their legs on the posted and established trail that begins there and starts just uphill and across the road. There is a second and slightly different option to enjoy, and interestingly enough, it goes to the same upper end destination, but instead of ranging out and around over the face of the mountain, this one moves up the drainage that lies slightly downhill from the scenic overlook. After parking in the overlook parking lot, walk down the road (not up as if going to the regular trail) to the drainage/barriers and cross over and down into the drainage on the right hand side of the road (opposite side from the parking lot). Once into the drainage simply start working your way uphill, remaining in the drainage for the entire hike. This area has for years been seasonally popular as warm rock, sunny pool swimming areas. Numerous ponds have been augmented to create deeper, larger pools, and depending on the level of flooding in any given year, those pools may or may not be large enough to enjoy some soaking, wading and perhaps some swimming. There is initially a bit of rock obstacle obscuring the route, but it is easily rounded. The rest of the drainage provides a variety of sandy or rocky surfaces to work your way up and around. Eventually, the drainage opens and widens as you near the top of the hike. The regular trail lies to the right and up above below the top of the ridge. A simple alternative return can include connecting and looping back on that trail, but there is a bit more adventure to be had hiking back down the way you came. The hike can also be extended ever further up drainage, but the logical turnaround is in that initial large basin. If there has been some nice rain there will even be a sizeable waterfall up above to highlight the trek. This can be a great picnic getaway... moving ever further from the crowds. 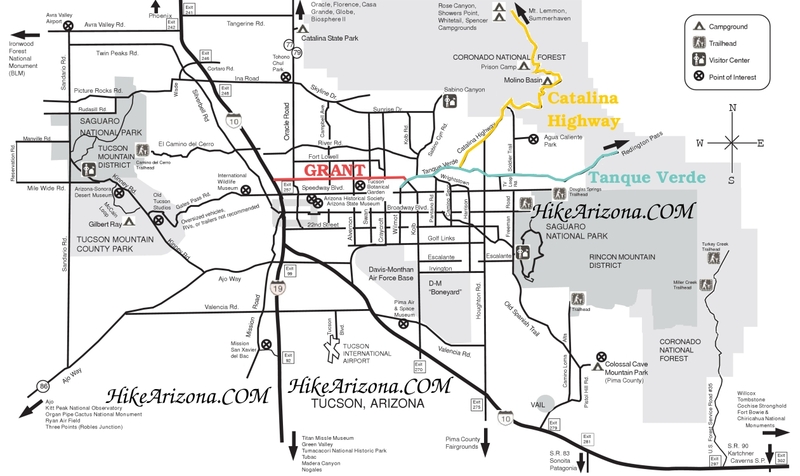 Take the Catalina Highway in Tucson up to the Catalina Mountains. Just past milepost 2 is the Babad Do'ag Vista pullout on your right. Park here and walk back to the highway for the hike.